Repsly now integrates with Destini, the world’s leading retail data platform, so your team can better identify opportunities and take action to improve consumer demand at your retail accounts. Join us in this webinar to learn how to empower your reps with retail POS data from SPINS, Nielsen and more for smarter store visits. Repsly is committed to being the Data Engine that you need to intelligently drive your brand forward. We’ll be releasing a lot of new capabilities over the next several months that will unlock the power of all the data your field team needs to succeed. The first of these initiatives is an all-new integration with Destini, the world’s leading provider of retail data from more than 100,000 store locations worldwide. With this integration, you’ll be able to equip your team in the field with data from SPINS, Nielsen, and more right in the Repsly mobile app -- giving your reps everything they need to make smarter store visits and start data-driven conversations with store managers. This partnership with Destini is a game changer, both for us and for anyone who uses Destini’s data feed for their store locator, ecommerce inventories, or simply to track sales velocity. In this webinar, we’ll show you how the Repsly/Destini integration empowers reps to make smarter store visits. Destini’s data feed gives brands a complete picture of where, when, and how their products are selling off the shelf. Repsly is built to give brands all the tools they need to sell better at retail. Our integration with Destini will fundamentally change the way reps approach their products in the store, allowing them to start data-driven conversations with retailers for smarter outcomes at the shelf. It all starts when a rep checks into the store. With the Destini integration activated, they’ll see the “Sales” tab at the top right-hand side of the Repsly screen on their phone. With just a tap, they can see the week-by-week sales at that store for every product in their lineup, plus an indication of previous visits they’ve made to that store. With that data, reps can get a much clearer picture of what’s going on in every account the moment they walk in the door. When reps have POS data at their fingertips they can put together a plan to maximize the opportunity at that store. Your reps can also use those trends to start data-driven conversations with retailers, making a better case for new displays, broader shelf presence, bigger orders, and more. Data like that helps brands accelerate growth in their key accounts, since they’ll always be measuring and responding to changes in demand. First up is empowering reps to identify out of stocks, then to work with the retailer to build inventory that matches demand. If a rep, for example, checks in to Nick’s Country Market, they might see their Free Fresh Sparkling Lemon and Free Fresh Sparkling Lime products both had two incredibly low sales weeks after consistently selling a few hundred dollars a week. That might indicate the products sold out during that time. This is a common problem that typically affects the best selling SKUs. Although the products have apparently been restocked by the time of this visit, the rep is able to get a picture of how they’ve been selling between visits. Armed with this data, your rep will be able to negotiate for an additional facing or two, or even a secondary placement to make sure there is enough inventory in the store to meet demand. With access to store-level sales data right in the Repsly app, reps can be smarter advocates for their brand and better partners to their retailers. Let’s take a look at another product, Grape-Splosion. In this example, perhaps our reps have been promoting this flavor, setting up a table and giving out samples at the store at each visit. One glance at the Destini data tells us that demos at this store contributed to a direct lift in sales by about $200 each week that we ran a tasting. This insight gives our reps the ammunition they need to negotiate for another run of tastings at that store. Or perhaps they could use this success story to convince a store across town to allow demos. In either case, access to hard sales data is helping these reps be more effective in the store. For any retailer, buying a deal from a new brand and making room for it on the shelf is a risk, and not usually one they’re willing to take likely. For reps using Repsly, it’s now easy to build confidence in your brand off the bat. Having success at a Nick’s Country Market? Replicate that success at the Nick’s across town by pulling up the data from one of the new deals or product launches that is working… in this case we’ll check out our recent addition of Matt’s Cheese Popcorn. You can see when we introduced this new flavor, it was a hit from day one! Now you can show the manager at the second store just how much business this new SKU can bring. What’s more, your reps can even use Repsly’s Search Nearby feature to source new, untapped opportunities where this product might also succeed. That last example is especially helpful for brands looking to build traction in new territories, or introduce new SKUs to the market. 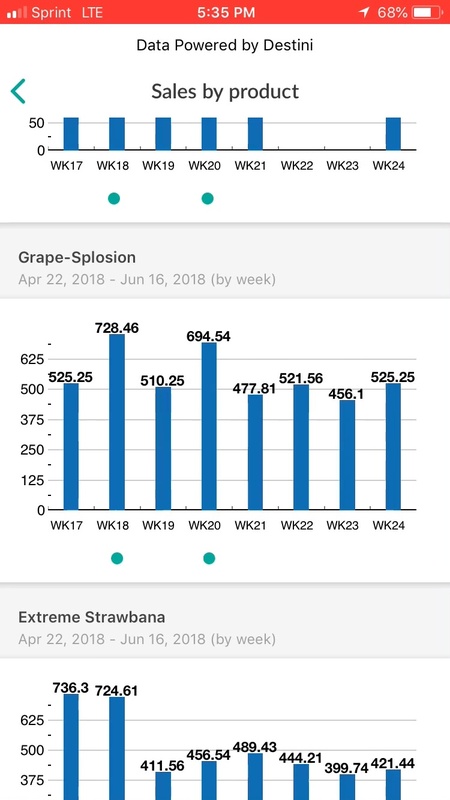 No matter what a team is focused on out in the field, this new Destini integration can help their reps execute better in the store -- whether it’s spotting potential merchandising errors, proving the value of in-store marketing campaigns, or opening and growing accounts by selling new deals. What we're most excited for is the sheer potential that this enhancement is bringing to Repsly. Putting sales data in your rep’s hands empowers them to do so much more than even what we just walked through. From evaluating product lineups to spotting cross merchandising opportunities and so much more in between. We’re really looking forward to seeing everything you’ll be able to do with this new Destini integration!